Holographic politicians... a vision of 2020. The 2020 race for the White House is already teeming with drama and intrigued, as happens when there are 20 — and possibly more — candidates. Each is looking to stake a claim and make their mark. But with many states to campaign in, and little time to do so, how can politicians be in more than one place at a time? 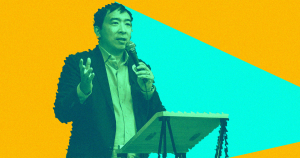 Democratic presidential candidate Andrew Yang has an idea: stump speech via hologram. Yang — a recently confirmed Futurism fan — is no stranger to new ideas, considering his signature campaign promise of a guaranteed universal basic income program. On Wednesday, Yang alluded to another futuristic idea with a plan to campaign using a holographic presence. He dropped the concept during a segment on TMZ, as spotted by eagle-eyed reporters at The Hill. During the segment, Yang can be seen showing off his hologram next to a Tupac hologram. While other presidential hopefuls have similarly unconventional plans to lighten the logistical burden of campaigning, Yang’s use of a hologram could allow him to be in many places at once, streaming in from a studio to answer questions live. At the very least, Yang’s technological push comes at a time where the role of technology in everyday life is being questioned. Politicians are taking stock of the presence of technology in our lives and, for better or worse, shaping a vision of our future that includes possibilities like Sen. Elizabeth Warren’s ambitious plan to break up tech giants, or Rep. Alexandria Ocasio Cortez’s gambit to balance a sustainable future with a technological vision.